Get up early and look out to the East to find comet Lovejoy, a brightening comet about 4.5th magnitude. From light polluted skies it should be easy with binoculars. I plan to go check it out myself and do a sketch. Here’s a finder chart for the next few days. Happy hunting! Since there is so much controversy over the performance of this particular eyepiece, I think it deserves a review from yet another point of view. Googling this eyepiece will bring up many mixed reviews, some good, many bad. I’ll try to show the eyepiece fairly in a range of different scopes and focal lengths. First impressions of this eyepiece by holding it is that it is pretty heavy, I havent weighed it but it has a good bulk to it. It’s about the size of a soda can. The reason I got this eyepiece was to provide a very wide true field in my 12.5″ Newtonian, which is the main instrument of experimentation of the quality of the views. 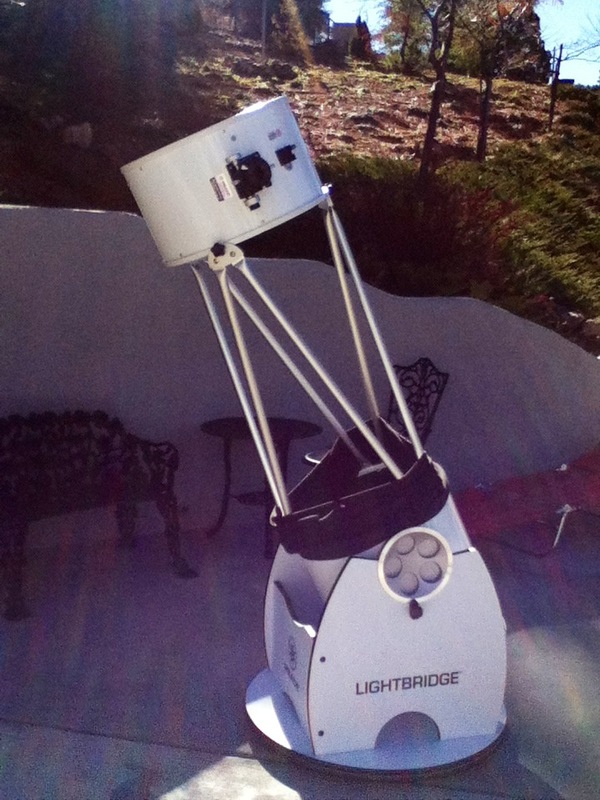 In the 12.5″, it provides a magnification of 63.5x, and a true field of view of 1.2 degrees of sky. For an instrument of this size and focal length (F/6), this is pretty good for finding objects. I won’t go into a full lesson on how to find objects, but I’ll put it out briefly that having a large true field is necessary in finding objects by being able to “hop” to stars to get you to a particular object in the sky. The larger the true field is the easier it will be when finding an object. I believe that to those who do not fully understand the importance of the focal length of the telescope, this review will be somewhat confusing, so bear with me here. So all telescopes have a focal length, the length that the light travels to reach focus (in your eye). This focal length varies by the design of the telescope. Let’s take my RV-6 telescope for example. The primary mirror has a diameter of 6 inches across. The focal length (distance where the light comes to focus) is about 48″. There are focal ratios that are also called the F-number. An F/1 6″ telescope has a focal length of 6 inches. An F/2 telescope has a focal length of 12 inches. F/3 is 18 inches, and so on. So the focal length of my RV-6 is 48 inches, or an F/8. These ratios are important in the performance of the telescope. Scopes with ratios from F/1 to about F/5 is considered short. F/6 to about 7 is considered mid focal ratio. And theres long focus scopes with ratios from F/8 on up. The longest ratios I have heard of are unique telescope designs called Schiefspieglers, check these out! Link here. Anyway scopes with a shorter F-ratio bring out aberrations that are naturally part of an eyepiece. Naturally scopes with long focal length with a particular eyepiece will be sharp stars to the edge (thats what you really want and hope for) with little or no aberrations. As stated earlier this eyepiece provides a nice wide field of view for finding objects as well as having a nice 80 degree Apparent Field. 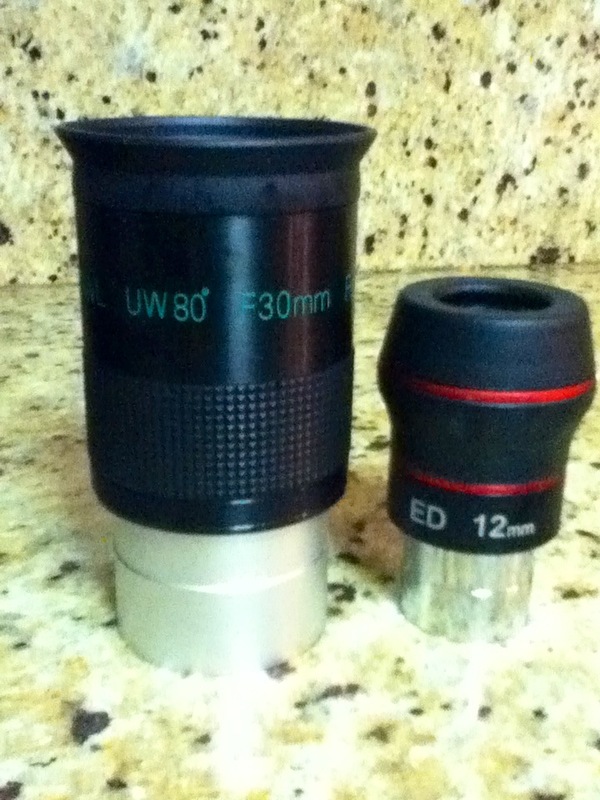 Many eyepieces are not their advertised AFOV, but this eyepiece looks just about to be 80 degrees. The stars at F/6 in the center are very sharp, also moving out. The outer parts of the field do show some abberations, but not nearly as bad as some have reported. The last 25% stars dont seem as sharp as the central area but still not that bothersome. The last 15% or so show field curvature, but really not that bad at all. As far as the performance on actual objects, very, very good for showing off larger objects like the Orion Nebula, or M37. The edges of the field are not perfect, but very usable I believe and I am not focused on how stars look. The eye relief of the eyepiece is not that huge, but not uncomfortable at all. Actually I find it to be great because some eyepieces with long eye relief suffer from blackouts, where your eye has to be positioned just right. Short eye relief is where your eye is crammed up close to the glass, not good either. One complaint I had with this eyepiece is that it suffers from some reflections from bright objects in the eyepiece, where a ghost image of a bright star or planet appears in the field. Sometimes bothersome, but not that big of a deal. Overall this eyepiece is great and is currently my most used eyepiece in this scope. The use of this eyepiece in this scope is definitely not recommended put simply. Much of the field suffers from aberrations and the inner 50% is very sharp. I tested this during my Arizona trip and still used it to find the objects that night. For this scope there are better alternatives for a finder eyepiece. To acheive an F/12 scope I simply barlowed the eyepiece in my Meade 12.5″, which changes the focal length from F/6 to F/12 (2x amplification). This also changes the focal length of the eyepiece from 30mm to 15mm, magnification is not 127x and the field is now 0.62 degrees. Here the eyepiece really shines even more. Image is very sharp throughout with very little aberrations at the extremes of the field. Owl 30mm 80 degree eyepiece. 12mm AT Paradigm right. So there it is. My impressions through different focal length scopes. The shortest focal ratio I would use it in would be F/6. If you have a longer scope and find one of these pop up for sale definitely go for it. Also let me say that this eyepiece was about $75 when it was first out for sale. This is what some people would call a “knock off” of the 31mm Nagler which retails for about $600. This means that these 2 eyepieces are in separate leagues altogether and should not be directly compared, as the Nagler would beat the OWL in probably every aspect. However the OWL is a very nice eyepiece and worth it if you can get one, I really enjoy mine. Well on November 8 we took a trip up to Prescott Arizona to visit my grandparents, and as I have mentioned before on here, my grandpa is an astronomer- at it for 59 years! Anyway, Saw a LOT of stuff but I posted it on Cloudy Nights. So as not to repeat, here’s the thread. One thing I don’t think I mentioned the thread, but the seeing (how steady the air is) was rated a 10/10. I have never seen skies so still before. One thing about going to dark skies is that I have found that you have to sort of re-learn the stars. I remember when I got into the hobby I visited dark skies- it was stunning. So stunning in fact, that I could not stick to my observing list. I found myself just looking up rather than through the telescope. It was like the first trip or two. Now when I visit the dark skies, I am still awestruck by the skies, but can get to work. I don’t really make observing lists, rather, I look on star charts at a certain constellation at what’s in the area and for a while, I’ll sweep through the constellation, looking at everything there is to see. When I have swept a few constellations of their most interesting targets, I go back and choose from the most interesting objects and sketch them. While in Arizona, I made only three sketches, but that’s ok. Generally, the sketches take time to do, but it does vary on the object. I’ve sketched objects in 10 minutes and some objects take as long as an hour to do. Even on the easier objects where I don’t think there will be much detail, I stick with it and find detail that often gets overlooked. I’m not sure if I included this in the thread, but the last object I looked at up there was Jupiter. It was getting pretty high by then (about 3:40 AM). The seeing was just so good that I was able to put on a very high magnification and the image would hold up. The highest magnification I went up to was 609x (this is with the 16″). The image was still good, and could have definitely taken more. The image was as good as in my 12.5″ reflector. The Great Red Spot was out, and I could see white swirls in it. The view that I had was one of the few times that it looks exactly like a photograph or better. By this time the temperature had dropped to about 37 degrees F* and I went back in. Hopefully I’ll be able to be making some sketches of Jupiter soon as I have not made one in a very long time, looking forward to it with the 6″ and 12.5″ especially!